Traditionally we listened to music via the radio or by playing recordings stored on some form of physical media such as records, tapes or compact discs. Nowadays the choices are far greater and include downloads and music streaming. Recently there has been a resurgence of interest in vinyl LPs among audiophiles. However we believe that LPs have significant limitations, particularly in relation to the playback of classical music. CDs provide very good sound quality through recent equipment, the range of music available on this medium is vast and the increased playing time of compacy discs make them ideal for classical recordings. Of course, opera lovers may well prefer Blu-ray discs so as to gain the benefits of video. Unfortunately many local CD shops that once provided a range of classical recordings have closed down and the majority of purchases now are made online, by phone or by email. Amazon has a vast level of stock available but provide little advice (apart from customer reviews of varying merit) for the novice purchaser. Amazon marketplace can be a great source of reasonably priced second-hand CDs for those who know what they are seeking. We do provide a link to Amazon in each of our reviews. 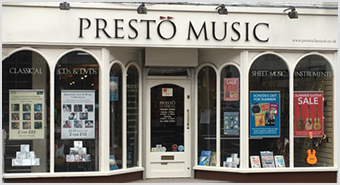 We strongly recommend Presto Classical, who have a physical shop, in Leamington Spa, Warwickshire, supported by what we regard to be the best website in the world for classical music purchasers. They hold a vast stock and the website has an outstanding search engine. Furthermore the business is staffed by musicians and music lovers who have a vast knowledge of classical music and recorded performances. Another source that we can recommend is Colchester Classics, a mail order only business run by Liz Leatherdale. Colchester Classics can be contacted by phone Freephone (0800 999 6994) or email to liz@colchesterclassics.co.uk and you will be offered help and advice in choosing the recording that is right for you. There are many web sites that offer downloads of classical music for sale. Sites that we have used, and found to be reliable, include Presto Classical (they provide downloads as well as physical material), Chandos, Qobuz and Hyperion Records. Chandos have daily offers on their site which offers downloads from many labels in addition to their own. Qobuz offers high resolution downloads (at very attractive prices for subscribers to their Sublime streaming service) of most of the recordings on their streaming site. Hyperion offer up to 20% discount on high value orders, which can be used to purchase credit they offer downloads from a range of labels including Signum Classics and LSO Live. It should be noted that no Hyperion releases are available on any streaming site. Streaming services provide online access to a vast array of music in return for a monthly, or annual fee¹. Of the general purpose streaming services Qobuz is currently by far the best for lovers of classical music. It has an excellent catalogue of new releases and older recordings and is streamed at CD quality or higher so that it is an excellent choice for those who wish to make streaming their main source of music. At lower quality, Spotify has perhaps the largest collection of classical recordings and some useful playlists. We recommend Spotify as a comparatively cheap, or even free, try before you buy (a CD or flac download) service. For those wedded to Apple products then Apple Music provides an increasing range of classical recordings and playlists at a similar quality. One of the problems with current streaming services is the difficulty of searching for particular recordings as the early models of metadata do not lend themselves to classical music. Two classical music only streaming sites are beginning to come to prominence; namely Primephonic and Idagio. Our initial trials of these products showed weaknesses in terms of repertoire and playback options but they hold great promise as they seek to overcome the search problem outlined above and to display high quality metadata (composer, work, movement, conductor, ensemble, etc.) We hope to have an opportunity to carry out a full review of these two services in the near future. In the meantime do give them a try. Both offer short trial periods. Other services that we rate highly are Medici TV and the Berliner Philharmoniker’s Digital Concert Hall both of which, for the price of a subscription, live stream concerts and make them available for watching later. For further updates to this page, please check back soon or follow us on Twitter for updates. ¹Some also offer a free option supported by advertising.